Some years ago, Marc Augé, a French anthropologist, wrote a book called Non-Places: Introduction to an Anthropology of Supermodernity. A ‘non-place’ is somewhere that seems to lack the characteristics that define a place (design, décor, architecture, and so on); instead, a non-place may seem to exist for purely functional reasons that don’t acknowledge a need for places to provide a sense of experience, aesthetics, or sensibility for those who inhabit or pass through them. Non-places famously include motel rooms, waiting-rooms, airport departure lounges, motorway service stations and many more. Everyone knows what it feels like: the moment when you push the button at a pedestrian crossing, and then stand there, waiting, waiting, waiting for the lights to change so that you can cross the street. It seems to me that this might be a quintessential non-experience; while waiting for the crossing to activate, the pedestrian really is quite suspended, doing nothing. A similar one might be sitting in your car in gridlocked traffic, unable to move forward or back, suspended within the car. Some of Augé’s non-places are also perfect for having a non-experience: waiting rooms, airport departure lounges, motel rooms… In fact, perhaps waiting really is the main characteristic of a non-experience: in an activity-driven, hyper-substantive world, being compelled, even briefly, to do nothing, can feel excruciating to individuals. Just think of those moments waiting for the crossing to activate: don’t those moments seem to take a long, long time to pass? Perhaps one of the great things about street art is its capacity to turn a non-experience into something else: a boring commute (by foot or in a car or on a train) can be transformed into an opportunity to view art, to be surprised, to smile, to feel frustration, laugh. Press the button to feel something; press the button to think. 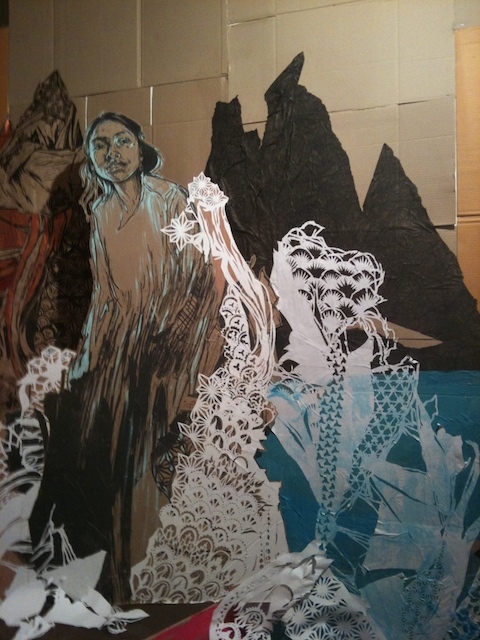 Last night was the official opening of Swoon’s show, Thekla, at Metro Gallery in Melbourne. It would be an understatement to say that this event drew the crowds. 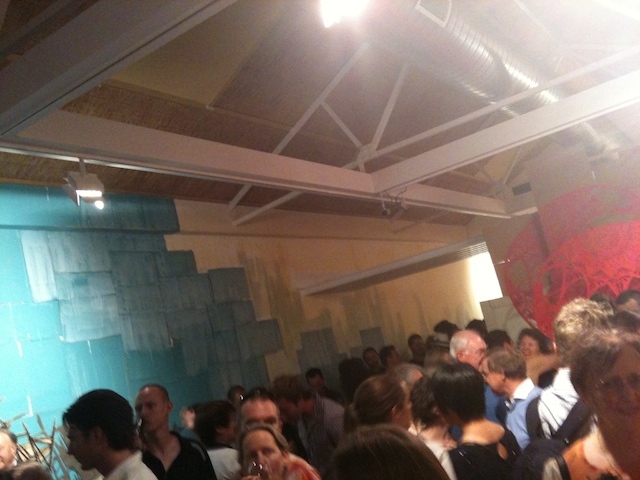 The gallery was packed. It was actually quite hard to view the artworks properly under those conditions, and so I’ll be returning another day for a better look. The show uses every inch of the gallery’s available floor space, and in addition re-shapes the gallery rooms (by adding painted and graffiti-ed steps here and there) and transforms its textures, by cladding its white walls with paper and cardboard. The artworks are sometimes affixed to these transformed walls; at other times they stand upright on the floor, angling out from the walls so that the exhibition has a pleasingly multi-dimensional feel. Apparently it took the best part of two weeks to install this show, and the efforts were well worth it – the space looks incredible. Some of the works I had seen before, on the streets or in other galleries. Even so, they are given a freshness by virtue of their inclusion here in a coherent large-scale show, which allows all of Swoon’s great strengths as an artist to be displayed: the sense of storytelling, the vividness of the characterisation of her subjects, the many different skills used in making the artworks, and the way that a gallery space is taken over by the artworks and converted, temporarily, into something else – some other space. It’s worth mentioning that Metro Gallery is based in Armadale, an area of Melbourne which is – you could say – not well known for its street art. Certainly, the crowd last night contained a large percentage of the very well-heeled and very well-off. And no doubt many of those present would have been well pleased by the speech given by the guest invited to launch the show, the Victorian Premier, Ted Baillieu. Baillieu’s speech seemed to have been written by someone who knew nothing about (a) street art (b) Swoon and (c) Swoon’s art. You would think that at some point yesterday afternoon when the speechwriter sat down with a piece of paper to sketch out a few talking points for Baillieu it might have been noticed that they were woefully under-informed. Apparently not. Baillieu talked at length, managing to embarass himself and much of the audience, who were cringing as he said incoherent things like ‘You’re Swoon, I’m swim, this is swell’. The best you can say about it is that after a time, the speech ended. Shockingly bad. Thekla is on until 5 March. ‘Worth seeing’ is an understatement. Regular readers of this blog will know that I tend not to do announcements about upcoming shows, figuring that there are plenty of other blogs and sites that do a sterling job in that respect. But every now and then shows come along which either seem so unmissable or they involve work by artists whom I really respect or admire. Coming up at Metro gallery in Melbourne is an exhibition that falls into both these categories. 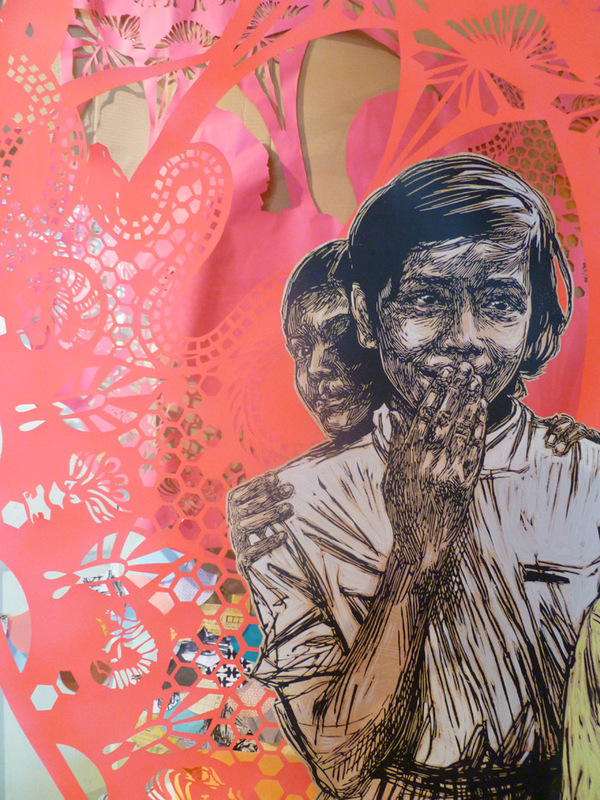 Metro is hosting Swoon’s first solo exhibition in Australia. 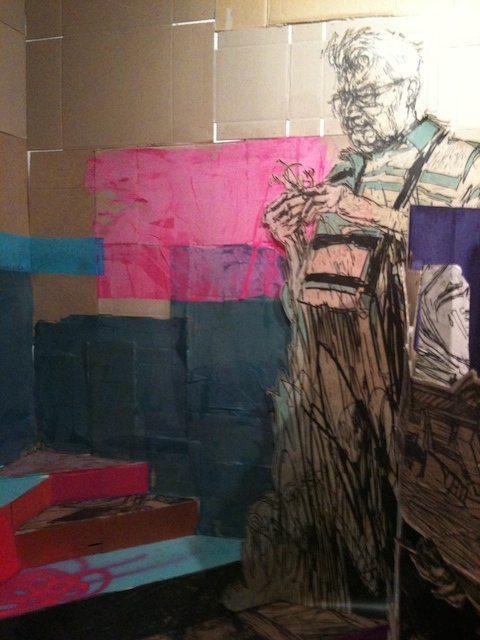 I’ve written about Swoon’s work before on this blog: you can read that post here. I’ve long been an admirer of her art: it is diverse but coherent, it moves beyond street and gallery with apparently effortless ease, and it has evolved in fascinating ways so that as well as adding artworks to buildings and other parts of the built environment, Swoon has in recent years been creating new built environments herself. 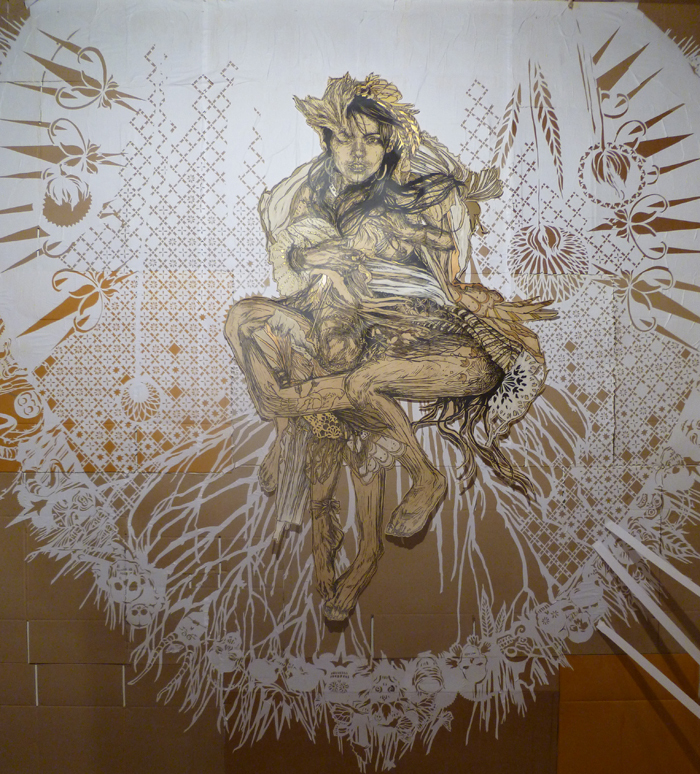 This is a TED talk given by Swoon in Brooklyn recently, in which she talks at greater length about her work. Totally inspiring and, again, such infectious enthusiasm. 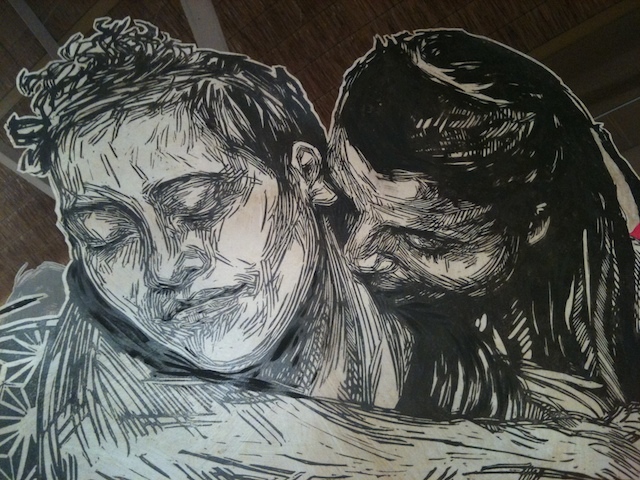 I was fortunate enough to meet Swoon last April in New York, and it really was one of the highlights of my time researching in this area. We spoke at length about the transformative potential of art and about the nature of relationships between people (and art) in public space, in neighbourhoods, in derelict spaces, on water, and in buildings. 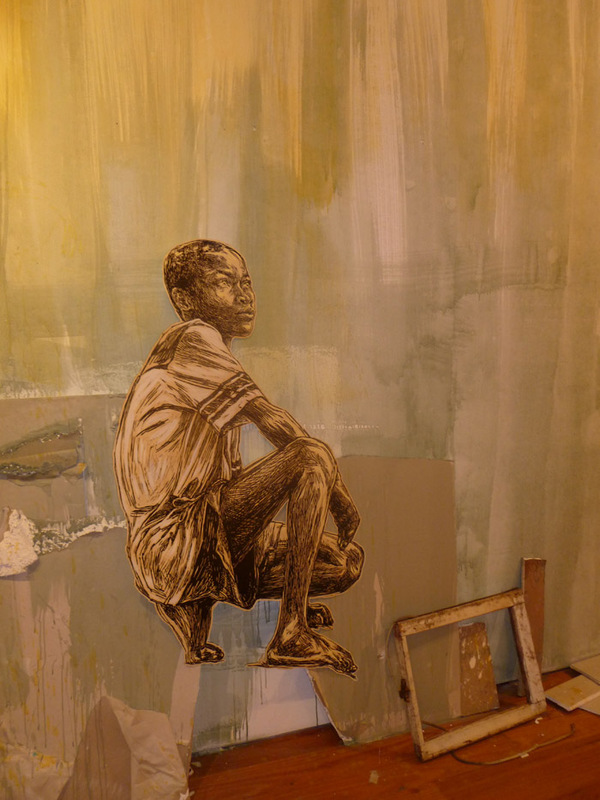 in November 2010, Swoon created a site-specific installation for the exhibition Small Acts of Resistance at Black Rat Projects in London. The exhibition was designed around the work of several artists whose work combines ‘the artist’s aesthetic vision and the activist’s world changing ambition’. 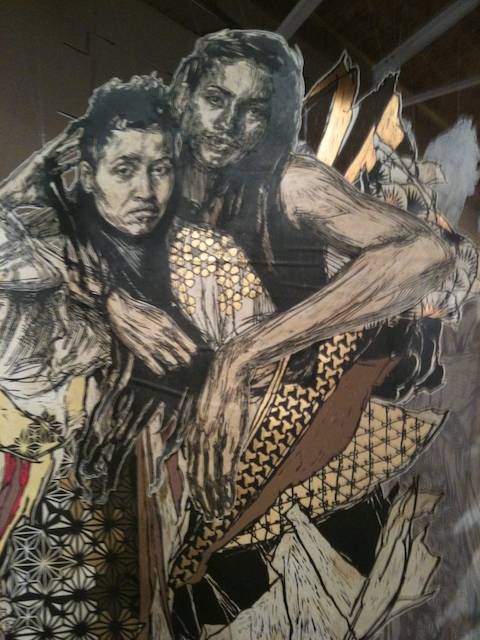 In Swoon’s work we see this combination at its most effective. The acts of a street artist may be relatively small, but their effects – well, their effects go far beyond the limits of any one paste-up or sculpture. Maybe art like this can change the way you see or the way you think. Go and see the show. It’s on from today until 5th March 2011, Metro Gallery, 1214 High Street, Armadale. 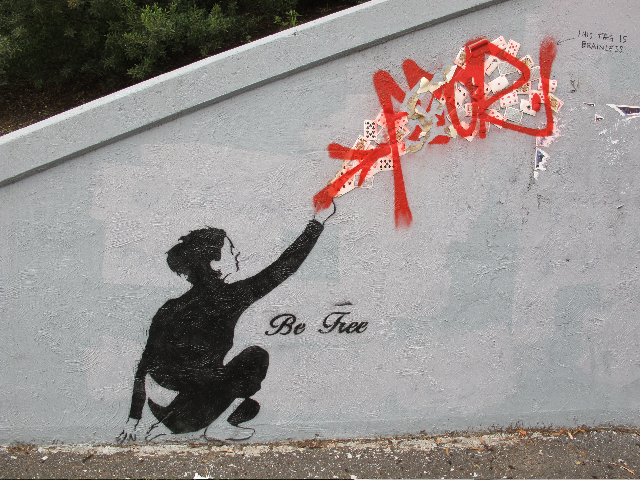 ‘Be free’: but not for long…. 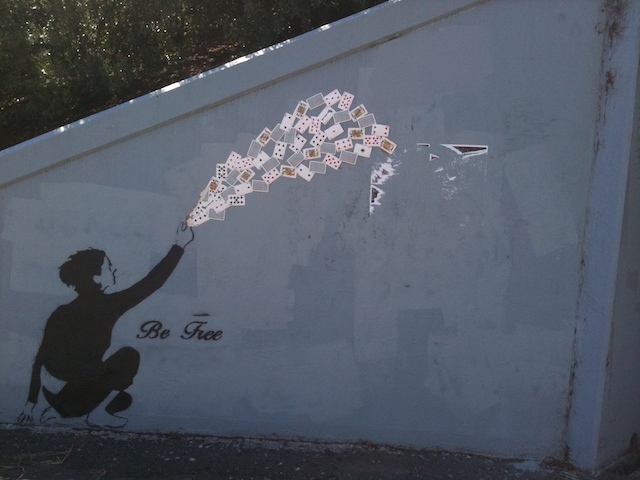 I recently posted here about a number of artworks around Fitzroy and Clifton Hill featuring a figure throwing playing cards into the air, accompanied by the text ‘be free’. As part of that post, I included a photograph of a very fresh looking ‘Be free’ artwork, at the entrance to an underpass in Clifton Hill, and on the day that I photographed it, the council graffiti removal van was parked nearby: I commented that I hoped it was not there to paint over this artwork. Well, it wasn’t, not that day at least. Indeed, the placement of the tag somehow connects with the image, even though it covers over many of those gorgeous playing cards. One passerby felt perhaps that the tag did not work well with ‘Be free’, and wrote bluntly ‘this tag is brainless’ next to it – so that the site became a series of layers of significations. Blankness. 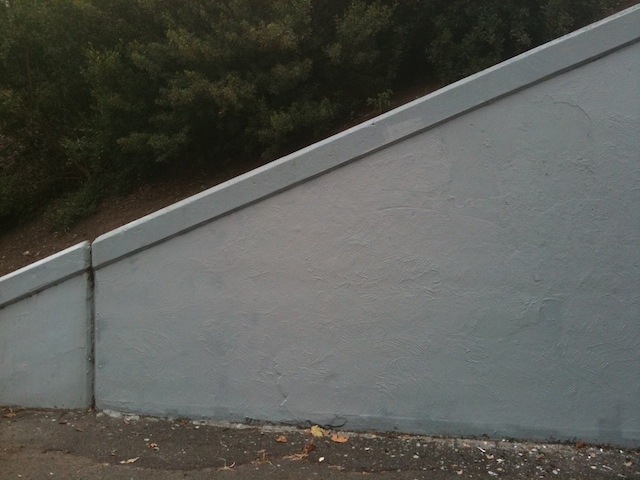 Fresh paint, no doubt applied by an assiduous graffiti removal van. Was it the presence of the tag and the subsequent commentary on the tag that attracted the attention of the graffiti removalists? Or were the artwork’s days numbered, as testified by the presence of the graffiti removal van two weeks ago – perhaps it was just working its way around the locality and was always going to paint over ‘Be free’, no matter whether it was tagged or not. I can’t help but feel sad for its disappearance. It fitted the site so perfectly. It must have made many people smile – those playing cards! Magnificent composition. I hope that more are being affixed to a wall somewhere very soon. Today I went to see ‘The Raft’, a video work by Bill Viola which is on display at the Australian Centre for the Moving Image (ACMI) until 20 February. I’ve written about Viola’s work on this blog before, when I saw ‘Ocean without a shore’ at the National Gallery of Victoria. That was in February 2009, and Victoria had just experienced its worst ever bushfires, and watching an artwork which displayed the boundary between the living and the dead as a metaphorical wall of water seemed inexpressibly sad and melancholic. Two years on, and Australia is experiencing floods. As many readers of this blog will be well aware, Queensland has been deluged with rain, with many parts of the state still under water after several weeks. Victoria too has been flooded in its northern, rural reaches; and on Friday night, the tail end of a tropical cyclone in Queensland meant that parts of Melbourne were awash with water. Suddenly, ‘so much water, so close to home’, as the Paul Kelly song would put it. Some of the floods that occurred in the last few weeks were flash floods: sudden onslaughts of water that appear out of nowhere, sweeping cars, street signs, and even houses with them. In parts of Queensland, people lost their lives, washed away by flash floods. Just as I couldn’t help but think about the bushfires when I saw Viola’s work ‘Ocean without a shore’ two years ago, today I was unable to watch ‘The Raft’ without thinking about those devastating floods. 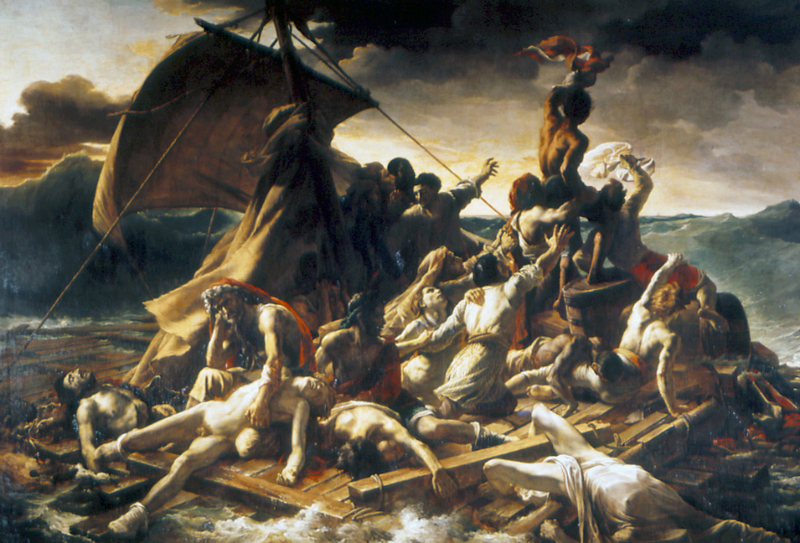 ‘The Raft’ (2004) echoes the famous work by Théodore Géricault, The Raft of the Medusa (1818-1819). It depicts the after-effects of the sinking of a frigate, the Méduse, which ran aground in 1816. Over 140 people clung to an inexpertly constructed raft; only 15 were still alive when rescue arrived. Viola provides us with a metaphorical raft, rather than any kind of actual vessel adrift on the high seas. Instead, the work, which is a video/sound installation lasting 10.33minutes, begins with a group of people standing in an anonymous space. It is, no doubt, the artist’s studio, but the figures act as if they are waiting for a bus, or a train, and soon that is how we look at them – they are a group of strangers, on the whole, engaged in the business of waiting, going about their everyday lives. Some of the group know each other: a couple here and there, but on the whole these are disconnected strangers. There are around 14 individuals when the work begins; gradually others arrive, and weave their way through the throng, to take up their own position in which to wait. As with all Viola’s work, the film is slowed down considerably, so that movements are heightened and rendered anti-naturalistic. The soundtrack is an indistinct blur of everyday sounds. After a few minutes, to the left of the screen, water appears, flowing over the ground. The figures on the left look down and it and around, but suddenly a blast of water explodes forcefully over the figures, not only drenching them but actually bowling some of them over: it is as though a water cannon has been unleashed upon them. At the same time, a similar jet of water begins from the right hand side, so that the figures are buffeted from all sides. People drop, in painfully slow motion, to their knees, attempting to brace themselves against the force of the water; some lie prone and motionless; others stagger around, blindly, trying to escape the jets. Splayed hands are raised in the vain effort to deflect the spray. On the soundtrack is a deafening roar, industrial, indecipherable. As with all of Viola’s work, the lighting is so cleverly done that each frame resembles a still painting; and in particular, of course, many parts of this work evokes Géricault’s own raft, and the possibilities of survival in the midst of devastation. I found myself sitting with open mouth, astonished at the images, unable to imagine (or perhaps only too able to imagine, thanks to the viscerality of the work) the suffering of the body in the face of so much liquid force. After several minutes, the force of the water begins to subside, until it gradually ebbs away. Some of the figures seem frozen in shock, their faces contorted and agonised. One woman shakes out her hair, which scatters drops of water in jewelled arcs. Two strangers discover that they are holding each other up. One boy reaches down to assist an elderly woman who has been lying motionless face down on the ground. Their disparateness is gone forever; these disconnected individuals are utterly joined together: the trauma of the event has forged a community. It’s all too easy to see this as a ready parable for the aftermath of disaster, and for the strength of community evidenced in flood-affected areas, and I’m slightly hesitant to give in to that reading. I would rather read the work as being about randomness. The individuals are simply going about their lives when the water arrives. (‘Water’ could be any disaster: fire, illness, crime, terrorism, bereavement…) There is no reason for it; it simply comes. There is no rationality to their reactions; once the water has arrived, they simply move about as they must. And once it has gone, there is no explanation for how or why they end up in the positions they do. They are just there. Such is the nature of disaster. It comes without warning; it has no reasons. Survival is random, as is death. All of Viola’s individuals are still alive after the water recedes: the raft saves them. The shipwrecked crew of the Méduse were not so lucky: over 130 of them died on their raft. The mere presence of a raft is no guarantee; the mere fact of survivorship does not generate community. And if communities are to be built, I would like us not to have to depend on disaster as the foundation for them. 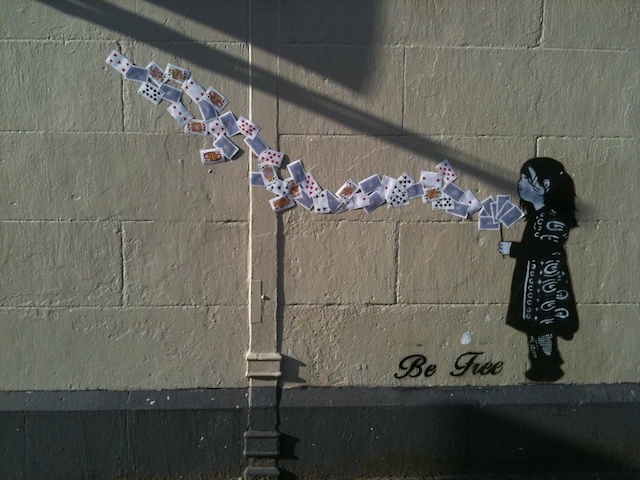 It’s a nicey composed work, a combination of stencil work for the figure and the text (which reads ‘Be Free’), with playing cards glued to the wall as though the little girl is scattering them to the winds. I really liked its positioning and execution, and thought that it was one of the most interesting works that had appeared around Melbourne while I had been away. But I also assumed it was a single work. 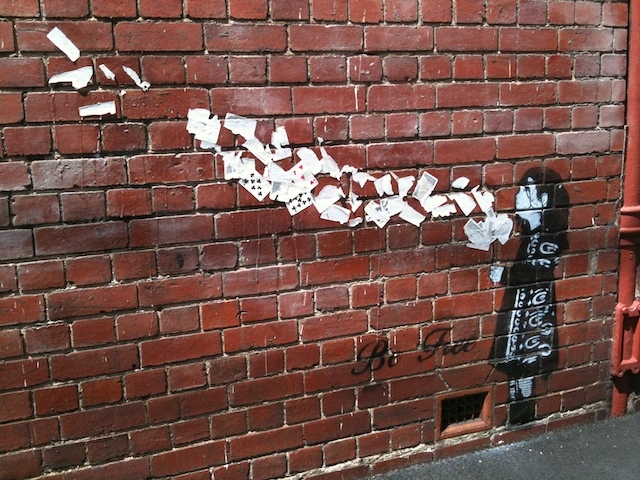 Again, nicely positioned; again, the combination of stencil work with the playing cards to add texture and dimension. A different positioned figure this time (and an adult rather than a child), and the composition seems altered to fit the different dimensions of this space, which is at the entrance to a rather drab underpass leading away from a MacDonalds and a brothel – exactly the sort of location that to me needs an exhortation to ‘be free’. I didn’t know who the artist was, although it seemed from the drawing that it might be signed ‘Kaff-eine’ (inscribed on the little fox). Last week, I received one of those emails from WordPress telling me that someone had subscribed to this blog (always nice to hear). The subscriber had a URL, which I clicked on. It turns out that the susbcriber is none other than Kaff-eine, and the link took me to this site, on which you can see lots of examples of Kaff-eine’s work. 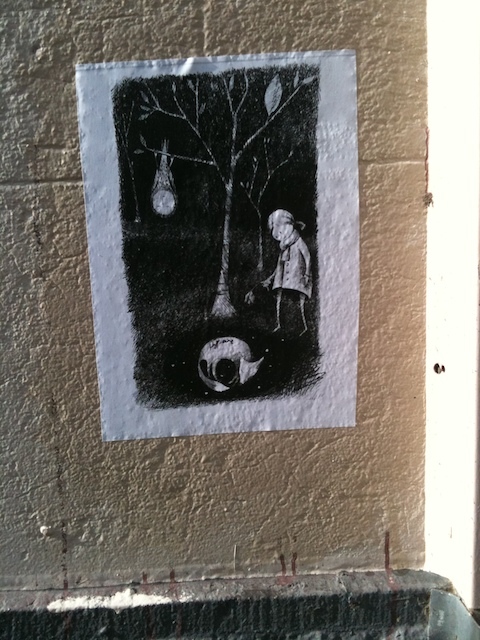 So, thanks, Kaff-eine, for subscribing, and thanks also for making such fantastic drawings and paste-ups, which bring the atmosphere of a fairytale or fable into the spaces of the city….